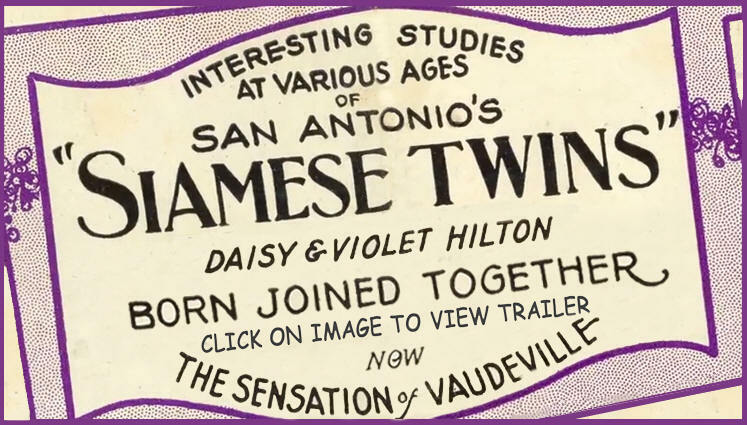 From the opening moments of the film it is clear that the public lives of Daisy and Violet Hilton consisted almost exclusively of a series of carefully composed press releases. The film, directed by Leslie Zemeckis (Behind the Burly Q), explores the arduous journey of two very unique women, struggling to establish personhood in a world that would scarcely acknowledge them as anything other than "freaks." 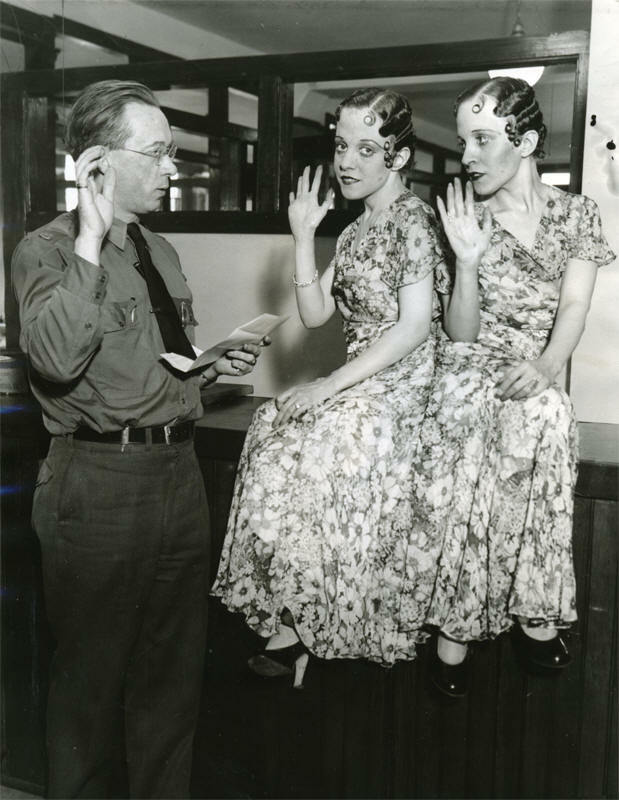 The sisters, born in Brighton, England, in February of 1908, were pygopagus twins, fused to one another at the pelvis. They defied the initial prognosis of their obstetrician, who stated they would not live out the month, by persisting until the age of 60. Rejected by their mother, who viewed the infants as punishment for their birth out of wedlock, the girls were sold to a woman named Mary Hilton. "Auntie," as the girls called her, recognized the commercial potential of the twins and placed them on display in the back room of a British pub where they could be examined by anyone willing to pay the price of admission. The men in Auntie's life (and there were several) were referred to as "Sir" by the twins. Between Auntie and her "Sirs" the sisters were fiercely mistreated, enduring near constant physical and emotional abuse at the hands of their guardians. Whisked around the world from the age of 3, and performing with lukewarm success in Germany and Australia, the Hiltons attempted to take on the US market, landing in San Fransisco in 1915. Originally denied entry into the United States due to their condition rendering them "medically unfit" for access, Mary Hilton created a media frenzy that mounted pressure on local authorities until they finally granted the twins passage. Mary's biological daughter, Edith, and Edith's partner, Myer Myers (a balloon salesman from Australia), took over the care of the sisters when their "Auntie" passed. Throughout the film there are various sound bites from the sisters which evoke a deeper insight into their separate psyches. When their guardianship transferred from Mary Hilton to the Myers, they refer to them as their new "owners" who watched over them, night and day, even occupying the same room as them while they slept. It was evident that during the course of the twins' lives, they viewed themselves as others did- as cattle and "cash cows," not as victims, but as property. Myer Myers exploited this and ensured that, however successful the twins became, they were never privy to the terms of their own contracts. Kept captive for a majority of their time, the twins were forced to practice their various stage talents, such as the saxophone and violin, for hours on end. To reinforce their confinement, Myers would continually remind the sisters that if they ever attempted to leave he would have them institutionalized. In the 1920's, when the girls were in their teens, they were placed on stages with vaudeville legends, appearing on the same bill as Charlie Chaplin and tap dancing with Bob Hope. The Hiltons' early vaudeville careers were a roaring success, netting them a profit of up to $5,000.00 a week, of which, they saw none. Their various managers and guardians ensured the twins were unable to profit from their own prosperity, and after considering the advice of Harry Houdini, who implored the girls to educate themselves on their public persona through newspapers and other media, the sisters pursued liberation through the justice system. Lawyer Martin Arnold helped to secure emancipation for Daisy and Violet in January of 1931, after which, the twins were awarded approximately $100,000.00 and approached life on their own for the first time. The immediate freedom they enjoyed after their emancipation was handled similar to any newly independent child, liberated from the grasp of their overbearing parents. Having no prior experience managing their own money, schedule or care, the twins languished without oversight. 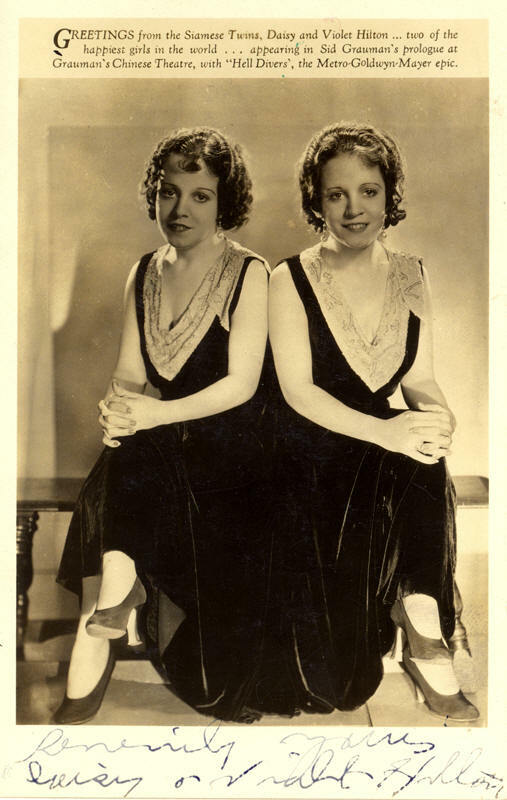 The sisters respectively fell in and out of love with various men connected to the show business, took part in a wedding for publicity and even managed to give birth while on tour. Though the child was given up for adoption, this did not lessen the burden on the two women as they continued to tour, even starring in 2 feature films (Chained for Life, Freaks). 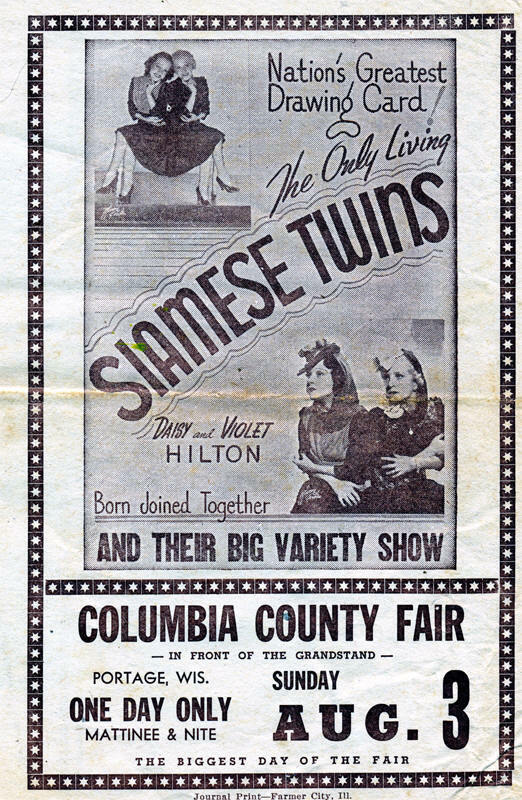 As their fortune began to dwindle and their fame began to fade, the sisters tried their luck within the burlesque community. After a fairly unsuccessful run in promoting their films and various performance, the sisters landed a small ad campaign for Phillip Morris promoting Twin Pack Potato Chips at a Park N Shop grocery store in Charlotte NC. Impoverished and desperate, the aging sisters implored the owner of the Park N Shop in Charlotte to take them on full time, incentivising the prospect by stating that he would only have to pay for one person. Wearing dated clothes and relatively out of touch with the world at large, the grocery store's break room became their stage. Supported by the local church and the surrounding community, the twins enjoyed the simplicity and solace of life out of the spotlight for the remainder of their days, though, some might argue they never stopped performing. Bound By Flesh takes on the legally and morally complex territory of the outward lives of two individuals who never really saw themselves as worthy of the same consideration. Featuring friends, family and professional colleagues of Daisy and Violet, alongside sideshow and vaudeville historians, the film's clout is inarguable, and the authority on the subject matter, unmatched. The film will pique the interest of audiences in the same way the Hilton sisters did throughout their lives. As a curiosity, full of salacious possibility, or as the heartbreaking tale of two women, unprepared for independence after success, Bound By Flesh is a humanizing and powerful must-see recounting of the rise and fall of these fascinating women.